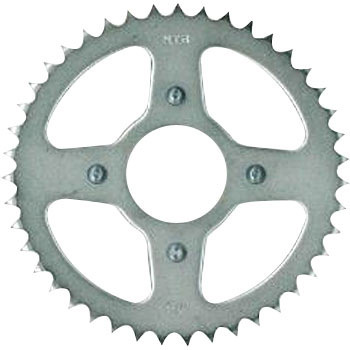 This sprocket is selected because it has the same design as the original and is long-lasting in iron. This review is about item#35132806. It is a standard manufacturer and a product with high reliability. It can be used without anxiety. This review is about item#35132675. I think that it is a very good product that can be removed and installed as normal. This review is about item#35131765. When we changed tire because we used for many years I replaced it with the chain. I think it will last longer because it is made of steel. I will look at the progress of the future Still, I just replaced it with four stars. This review is about item#35133086. We replaced and ran, but there is no problem at present. Price is cheap and is satisfactory. After that, durability is a problem. This review is about item#35132343. The tooth number 14 for NSR 50 is used for the monkey 4L, the sprocket body is I was able to wear Sunnari without any problems. The inter-screw pitch of the retaining washers did not match the current car, and the holes in the washers were slightly processed and attached. This review is about item#35131923. This review is about item#35131844. I purchased it because I wanted to adjust with the rear sprocket rather than enlarging the front sprocket. no problem. I think that there is durability if it is heat treated, but how is it? This review is about item#35131826. The previous sprocket was made of aluminum 7075 but it is aluminum after all How to reduce was not good. Normal sprocket is longer last I will do it. This review is about item#56578637. I used it for the exchange of the front sprocket of the Suzuki K90. There are no frame interference and no problems with 14 sets. It is a good product. This review is about item#35132614. Since NTB's sprocket has been used many times in the past, it is the price. This review is about item#35131835. It was saved because we handled it with monotaro. Quality is no problem as it is a famous manufacturer in this world. This review is about item#35132203. I used it for changing the gear ratio of the Little Cub which bored up 75cc. With F16, it was improved that the 1st speed could be blown quickly. But acceleration force may have dropped for a while. C50 T13 → T15 I think that spline cuts are completely opposite in C50 and C90 and the pitch between the bolts which did not attach the setting plate as it is is different, so when thinking to sell gears I think that it is kind to sell them as a set Even if it gets a little high it will eventually improve the feeling for the user's comfortable use Clearly there is plenty of torque to spare, so we will also replace the driven gear We processed the setting plate and attached it. This review is about item#35131783. I exchanged it from 39 to 36 dogs It was possible to use it without problems. It is a stock to prepare for replacing the rear sprocket. It is reliable general-purpose parts made by NTB not inferior to genuine parts and quality aspects. This review is about item#35762343. I bought it cheaply, it was a performance that was not different from a genuine product. It can be used without any problem, I am satisfied because it is cheaper than genuine. About 70% of genuine products. There seems to be no problem with quality from appearance and touch. Durability is about to come. I bought it for exchange of chain and sprocket of commuter turnip. Since I was using NTB made from before, I could exchange without problems. It was nice to purchase cheaply with front and rear sprockets and chains. I will purchase it regularly in the future as well.